This Ayurvedic oil blend mixed with organic brown sugar, contains natural fatty acids that help feed the skin's surface. These nutrients help create greater elasticity, lock in moisture and firm up the surface of the skin, reducing signs of aging. Also great for soothing the skin after shaving. 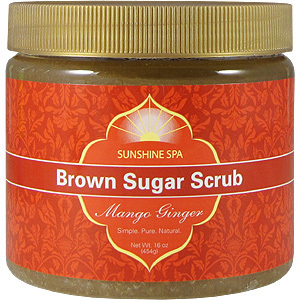 Sunshine Spa's Brown Sugar Scrub is made with 100% organic brown sugar that will pamper you and give you the pleasure of a world class spa everytime you enter your shower or bath. Fantastic as a full body smoother and a gentle alternative to salt scrubs, especially after shaving. 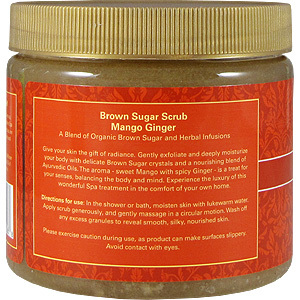 Brown Sugar scrub contains natural fatty acids that actually feed the skin. These nutrients create greater elasticity, lock in moisture, naturally exfoliate and help firm the skin surface. Moisten the skin with lukewarm water and massage into the skin in a circular motion. Gently exfoliate dry, dull skin from the surface revealing the radiant, healthy skin beneath. Simply wash away any excess leaving the skin silky smooth and deeply moisturized. Organic brown sugar, expeller pressed almond oil, high oleic sunflower seed oil, high oleic safflower oil, avocado oil, grapeseed oil, apricot kernel oil, vitamin E, essential oil of ginger, basil leaf, ginkgo leaf, sage leaf and fragrance. 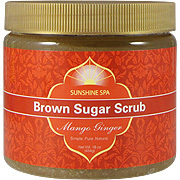 Brown Sugar Scrub Mango Ginger - is shipped in a discrete, unmarked package. Orders are processed immediately and usually take about 3 to 5 working days to be received. We do ask that you try it for 2 to 3 weeks to feel the full effects. Any information received is used only for order processing and shipping purposes. Your information, such as e-mail address, will never be disclosed to a third party.